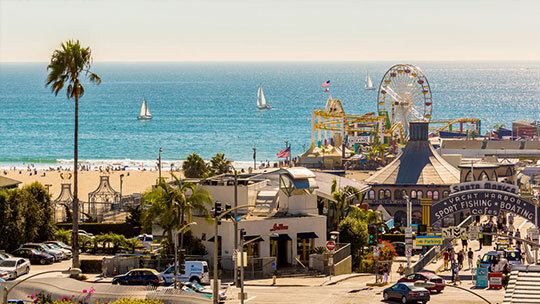 Santa Monica is a beautiful place in Los Angeles County in California and offers one several tourist attractions to be a part of. The right kind of party bus in the form of Santa Monica party bus or limo will guarantee that you don’t miss a single thing when you have so many things to go sightseeing for. There is the Third Street Promenade that can be your first stop in the Santa Monica party bus rental service website. It is a completely pedestrian area. This is one of the very few streets in Southern California that is closed to vehicular traffic of all sorts. The way the whole ambience of the place has been designed is to have a whole lot of eating stalls, shopping and people just sitting around watching the world pass by. You can get off from the party bus and saunter around as a group whilst the party bus driver goes on to park the party bus close by. When you are done with the Third Street Promenade you can board the bus and move to the next stop which can be the Palisades Park. With the traveling in the Santa Monica limo service it is absolutely simple and easy to hop from one venue to another without any hitch to the traveling or the plans. This is a new park and is great for walks, watching the most fantastic of sunsets this part of the country and also experiencing the great greenery and nature all around you. There are some fantastic benches out here where you can sit and have a fabulous heart to heart chat with your group or beloved.The party bus is the perfect one to move you on to the next place which is the Santa Monica Pier. This is the place wherein you will be able to see the pier in its entire splendor and go back a hundred years in time when the pier was actually built. The pier is really long and stretches all the way up to 9 acres. There are tons of visitors who come here all the time as it is so very beautiful. You can either get off the party bus and look at it from close quarters or look at the most fantastic of views as the bus passes by. The next stop if in Santa Monica has to be the Main Street. This is the place wherein you can do all your shopping be it for the most fantastic of local boutique fashion stuff. There are several live performers out here that add on to the Promenade kind of culture. You will find several people enjoying a job, walk or just skating along. You can complete your evening by watching the sunset from the Santa Monica party bus as you travel to a restaurant for dinner. For your reservations please visit our website.